We all enjoy good food and strong drinks. But how can you write about them in a way that transcends “really good,” “awesome,” and “delicious”? In this workshop, taught by Hop Culture magazine editor in chief and cofounder Kenny Gould, you’ll learn how to write tantalizing descriptions that also tell a story about that special bite or brew. Expand your vocaulary and try your hand at food and drink writing in this low pressure, supportive environment! Whether you’re a novice blogger, an aspiring reviewer, or a full-time critic, the workshop will help you break out of descriptive clichés and effectively convey an experience through writing. 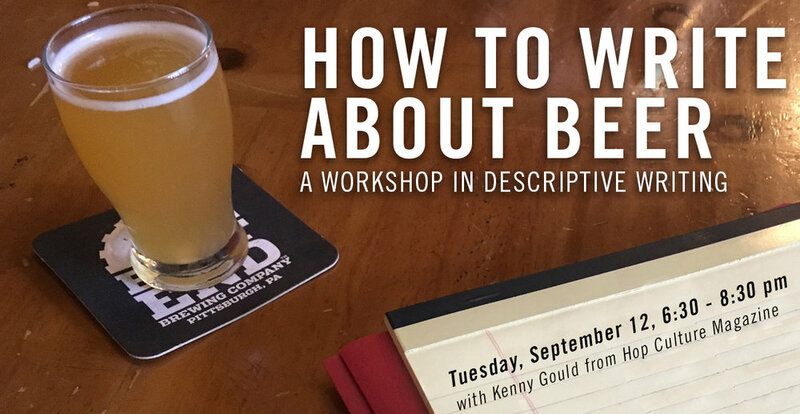 Although the skills learned in this one-of-a-kind workshop are geared toward beer writing, they can be applied to any type of descriptive writing. This two-hour workshop will consist of instruction, writing prompts, a free beer tasting, and more! *Advance registration is strongly recommended. Click here to buy tickets.